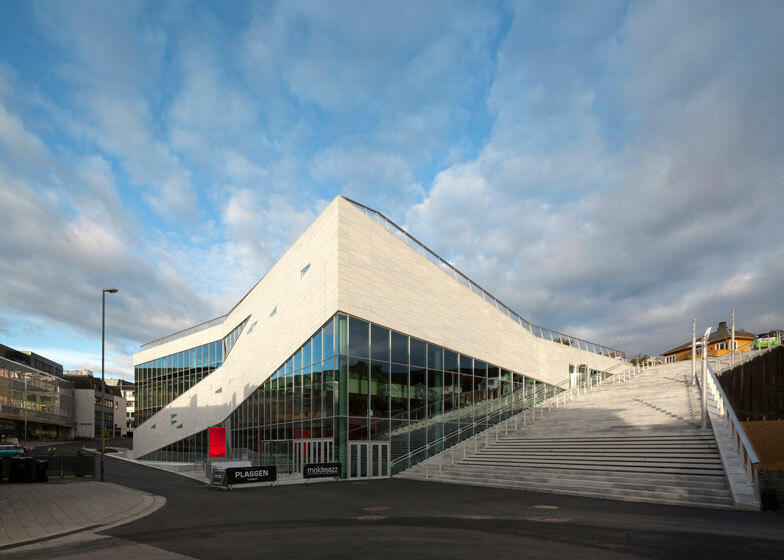 Stone bleachers climb onto the roof of this cultural centre in Molde, Norway, by Danish architects 3XN, creating open-air seating for visitors to the jazz festival hosted there each year (+ slideshow). 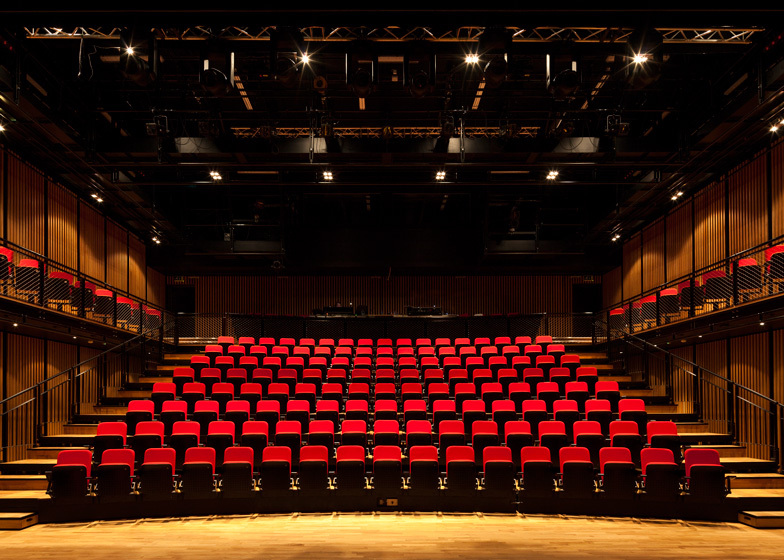 Located in the heart of the small town, the Plassen Cultural Centre will become a hub for the July event, which is one of the oldest jazz festivals in Europe and attracts around 100,000 tourists. 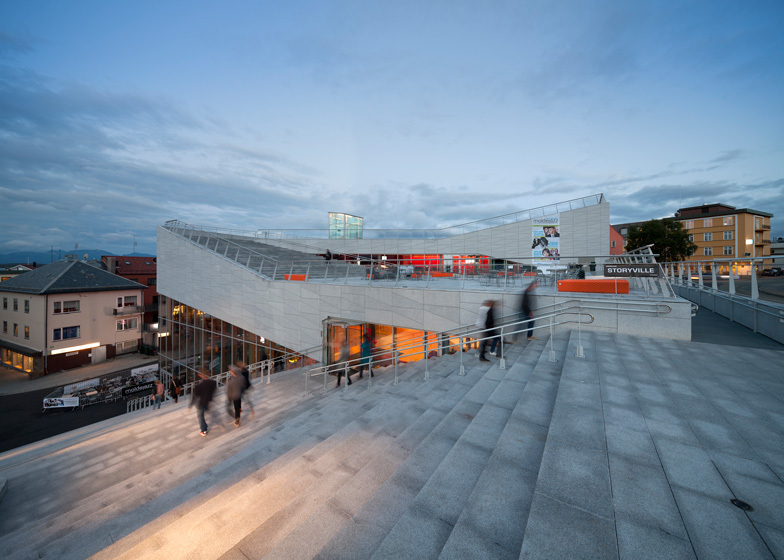 The external staircase adjoins the northern wall of the building, linking the neighbouring market square with a roof terrace that accommodates a sunbathing lounge, an exhibition area and a sculpture garden. 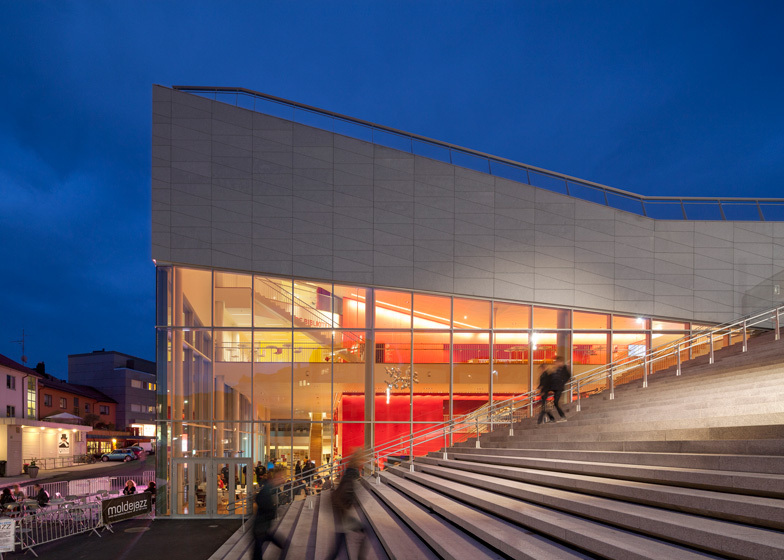 The entrance to the three-storey building is positioned at the foot of the stairs, and leads into a concert hall through a triple-height atrium. 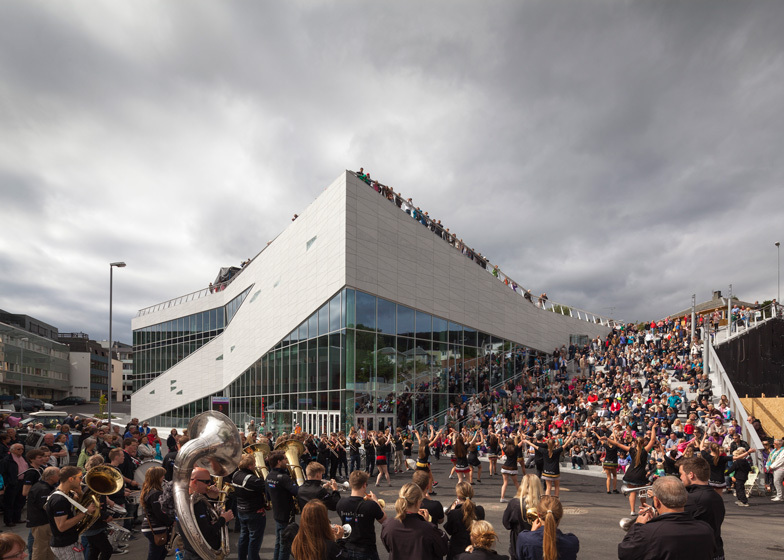 "There must be room for celebration in this building, both inside, on top of it and around it," said 3XN's Jan Ammundsen. "It must be able to withstand being invaded by happy people throughout the year, year after year." A jazz museum is also included inside the building, alongside a library, a small gallery and a series of rehearsal studios. 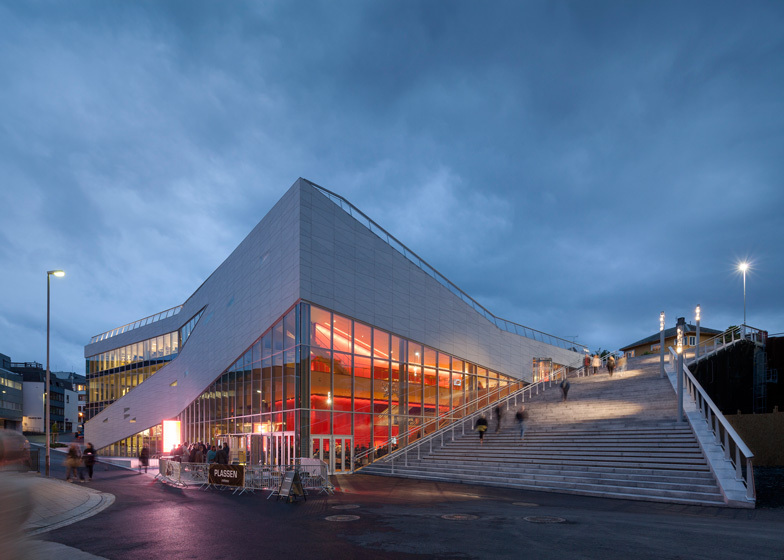 The architects used granite for all the exterior surfaces, which they claim "gives the building a bright monochrome expression" that contrasts with the "warm red light" that shines out through the windows. Other projects completed by 3XN in the last year include another culture centre with glass hills outlined on its facade and an experimental food laboratory. Photography is by Adam Mork. ‘Plassen’ (meaning the square or the space in Norwegian) is formed like a giant paper cutting. The building literally grabs the city square, Gørvellplassen. It cuts and folds the surface, resulting in a building where the inside and the outside, the surface and the roof, merges into one. 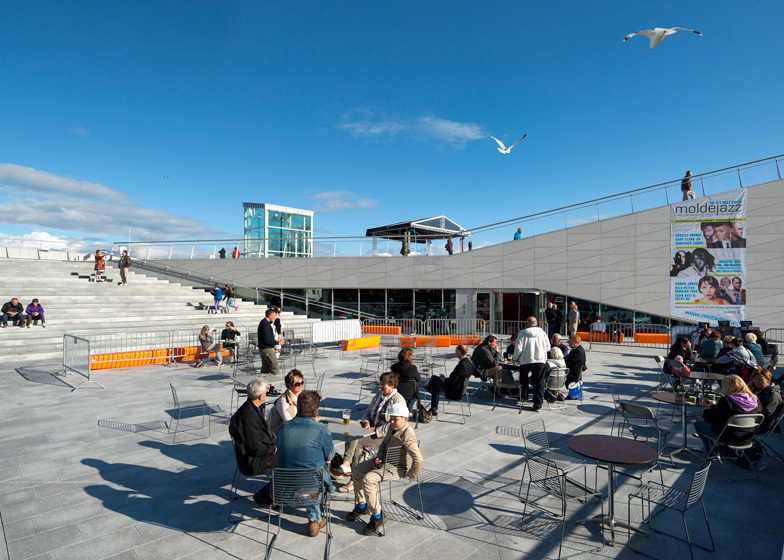 This compact and well-functioning structure with its highly usable and easy accessible areas maintains the public space of Gørvellplassen, and even enhances the flexibility of the square. The flowing transition between the stages, the gallery, and the café creates the illusion that the inner and outer spaces are one. Emphasizing this principle, the windows of the building can be described as wide horizontal openings allowing plenty the daylight, and providing a splendid view from within as well as from the outside. 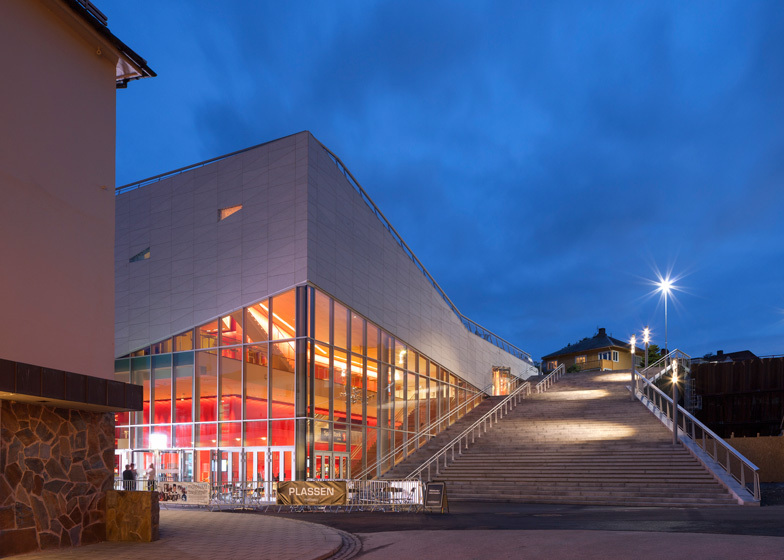 The relatively low-rise building consists of just three floors that make room for the local theatre, ‘Teatret Vårt’, ‘The Bjørnson Festival’ and Molde’s International Jazz festival which attracts famous jazz musicians and a wide audience when it takes place every summer in July. Contemporary and innovative, but at the same time simple and blunt, the design of the building resists any excesses. Hence, it is in accordance with the surrounding sober and regularly shaped buildings. Use of the same local stone on both walls and floors, creates a calm atmosphere. The exterior is dominated by the broad staircase. This created a lot of space for people to rest in nice weather. The staircase provides the jazz festival with a big open-air stage that may become a new focal point for the town. 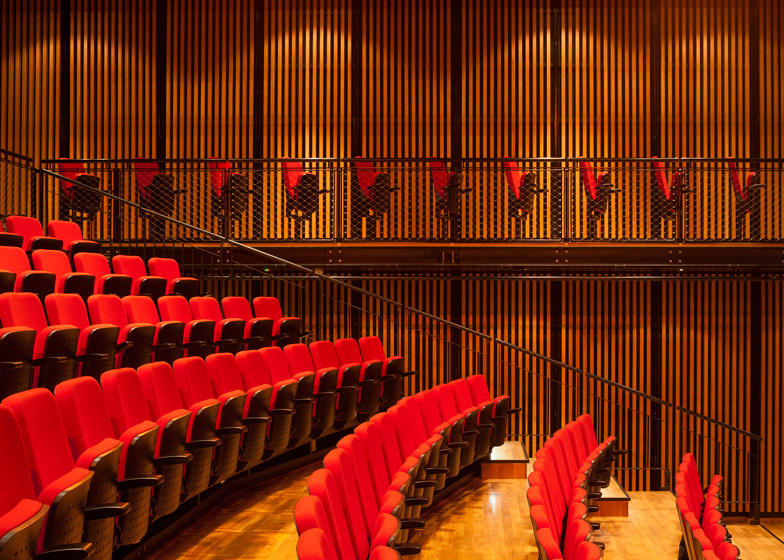 The heart of the building is the main concert hall, solved in “box in box” room, to ensure optimal acoustics. Therefore, the concert hall is rectangular and stripped of fancy shapes. Finally, ‘Plassen’ contains a library and an arts centre with a gallery facing the upper square. The library is situated in the eastern wing with a strong exposure to the square.